About half of the population will one day have a vein problem. For some, it will involve the thinner, blotchy spider veins that don’t bother some people, but cause itching or burning in others. Still others will be plagued by the more noticeable bulging of varicose veins. Most varicose veins appear in the legs due to the pressure of body weight, the force of gravity and the task of carrying blood from the bottom of the body back to the heart. 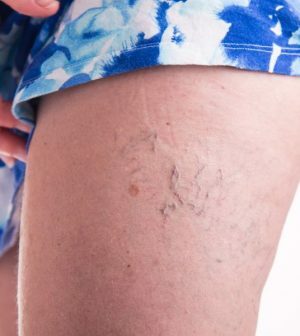 In some people, varicose veins simply look bothersome. In others, they can cause pain and throbbing and even serious problems like skin sores that won’t heal, bleeding and either superficial blood clots or more dangerous ones called deep vein thrombosis. These can be fatal, should a clot travel to the lungs. In mild cases, lifestyle changes — like exercise, propping up your legs when resting, wearing compression stockings and losing weight — can help. But when symptoms are severe and you need to prevent complications or simply want to improve your appearance, it might be time to consider a medical procedure to get rid of the problem. A varicose vein becomes swollen, red, very tender or warm to the touch. You develop sores or a rash on the leg or near the ankle. The skin of your calf and ankle thickens and changes color. Symptoms are getting in the way of everyday life. You start to experience any kind of pain. Options include lasers, injecting the vein with a chemical that causes it to collapse, and different types of surgery, which are usually reserved for very large varicose veins. Just keep in mind that while treatment can help existing varicose veins, it can’t stop new ones from forming. The Office on Women’s Health has detailed information on both varicose and spider veins and how to treat them.